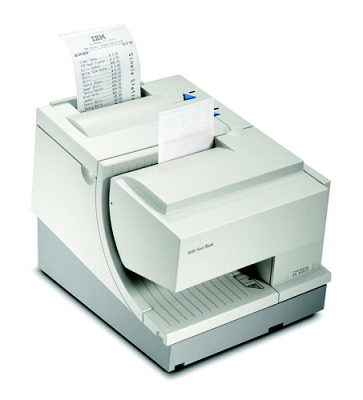 The IBM 4610 SureMark Printer Model TI8 is a high-function model, featuring high-accuracy OCR/MICR reading, check imaging, and faster single pass check handling than previous Models. These functions are critical to the successful implementation of Electronic Check Conversion in US retail accounts. This model prints at 52 lines per second and offers support for TrueType fonts. It is capable of printing color thermal papers. The cover color of this model is Pearl White for the top cover, with either Litho Gray or Storm Gray for the bottom cover. This model can be attached to IBM system units via RS485 or USB interface adapters and it may be attached to other POS manufacturers terminals or PCs via RS-232 or USB. This is a two-station model.